Originally Chrissie Smith chose to study Biochemistry at University and only in 2006 did she pursue her lifelong ambition to study art. At Glyndwr University she re-discovered the challenge of experimentation but this time with clay, wood and glass. She qualified in 2010 with a degree in Applied Art specializing in Glass Fusion. Chrissie’s landscape sketches and digital images produce a huge resource but she has discovered that these are the starting points. When working with the glass new ideas emerge. She likes to use the strongly coloured American Bullseye fusing glass and overlaps the colours like layers of watercolour paints. Textures are produced in two ways, either by the use of different grades of glass and copper or by texturing media used during the firing process. More recently Chrissie has used a mix of ground glass to write and sketch images that are permanently fused in the glass at 800C. 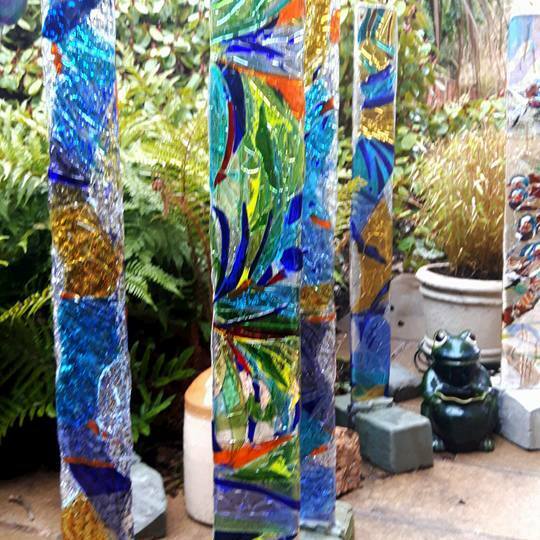 At University she developed fused glass panels for garden sculptures and wall panels. This work has continued to be exhibited at various ‘ART in the GARDEN’ settings:- Sir Harold Hillier Gardens in Winchester, Lymm Festival, Lane End Nursery and Mount Pleasant Gardens, Kelsall. Chrissie’s upbringing near the coast at Formby, Merseyside has given her a love of wildlife. Over the last few years her glass paintings have included studies of birdlife seen in her locality. These pieces of work have been selected for view at the National Exhibition of Wildlife Art and also hung at the Animal Artists Association Exhibition at Castle Park, Frodsham. The last four years she has been contributing to the Funky Aardvark Artists in Chester and Teignmouth, displaying her small panels. The Wirral Open Studio in June has been an opportunity for Chrissie to join local artists to share and display work to the public. She has enjoyed demonstrating the glass painting technique and encouraging others to experiment.